HR are the experts in developing teams, right? The role of HR is to get the most out of the human capital in any organisation. One of the many ways they do this is to help create high performing teams across the organisation. Developing these other teams is hard enough, but the really important team, the one that sets the tone and plays the biggest part in delivering success, is the one that sits around the board table. The first job of HR then is to unlock the human potential in the top team. Leadership Teams are different. 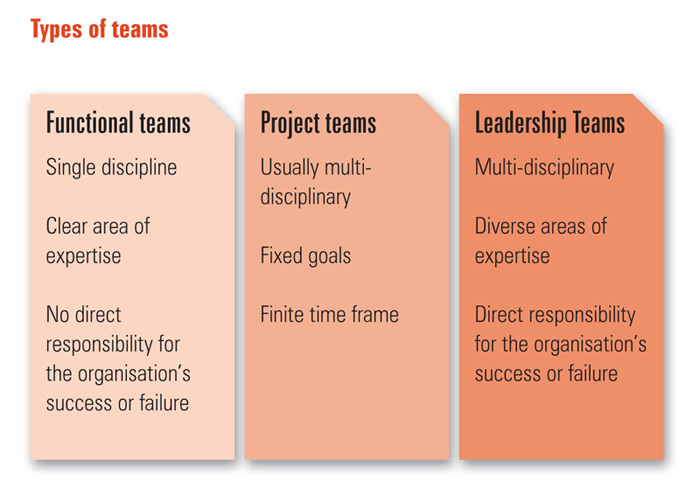 Whilst some of the research and tools on teams generally does have some value in top teams, they are different to other teams in the organisation in a number of critical ways. To successfully unlock the potential of a Leadership Team, you first have to understand these differences. These work within a single discipline, often running a department. Because each functional team has its own area of expertise, its members will often have similar backgrounds and viewpoints. This can lead to a narrow frame of reference and a lack of understanding of the needs and challenges of other parts of the organisation. While every department makes its own contribution, it is only at the top that the strands are brought together to contribute to an overall responsibility for the organisation’s survival and profitability. No functional team will ever be in control of all the elements of profit or other ultimate financial outcomes. These are usually multi-disciplinary, with members drawn from different departments. Individuals in the project team generally find themselves reporting to their bosses in the ‘home’ department as well as the project team leader. The goals, deliverables, scope and authority of project teams are usually defined at the beginning – so they can operate with a clear mandate and within agreed parameters. When the project comes to an end, the project team is usually dissolved. Project teams are therefore focused on fixed and finite goals, to be delivered within specific time frames, and are not usually expected to look out at broader perspectives. Leadership Teams are qualitatively different. They are composed of the people who run the organisation, or who head a profit centre within a larger organisation. Unlike functional and project teams, they are responsible for the organisation’s overall performance. They are accountable for profits and losses to stakeholders such as investors, holding companies, boards of trustees or, in the public sector, political leaders. If results are good, the Leadership Team will get the credit. If things go wrong, it’s the Leadership Team that will carry the can. At its best, the Leadership Team is in a position to piece together a complete and near-perfect view of the organisation and its world. In practice, though, this seldom happens. If the Leadership Team isn’t creating strategy and making strategic decisions, there’s no-one else who can fill that gap. While most members of Leadership Teams will recognise this imperative, very few would claim their own teams are fully achieving it. The Leadership Team has to understand and manage the wider environment, from investors to economic pressures and from customers to markets. It has to integrate all these elements with a range of internal factors, and everything from markets to organisational goals is usually in a state of constant and rapid flux. Decisions are, therefore, inevitably far more ambiguous and complex than at any other organisational level. There are frequently several ‘right’ answers to any question (as well as a multitude of wrong ones). The organisation’s shareholders or a parent organisation are often relatively remote, with little direct contact with the team. The Leadership Team is, therefore, usually able to operate with a high degree of autonomy to match its high degree of accountability. When strategy fails, however, accountability is clear – and often ruthless. This accountability for results places high demands on the leader of the team, often putting him or her under great pressure, which in turn bears down on the other members of the Leadership Team. This has a significant impact on relationships within the team. Insecurity, misplaced competitiveness and anxiety about personal performance often have a destructive influence. Leadership Teams are always in a state of flux. People do well and get promoted, or are lured away to new challenges. Often the team will welcome a new person every few months, with each line-up change introducing new dynamics, demands and questions. As individual talents come and go, the dynamics of the team alter and members have to learn – and often relearn – how to work together. Leadership Teams have a different breed of people around the table. By the time he or she is invited to join, each Leadership Team member will already have a high level of expertise and a proven track record. Critically, their success to that point will often have been based on individual, rather than collective, leadership skills. Few members will intuitively operate as ‘team players’. They are usually highly driven, competitive, ambitious and confident. The challenge is to harness this individualistic energy and flair in a context that demands close collaboration with other forceful talents. The job of Leadership Teams is to get results, usually by making things work across boundaries – both within the organisation and also with partners, customers and suppliers. Each individual controls some of the resources and levers needed to deliver the changes sought by each of the others. Team members must negotiate to get support for the changes they believe are most important. There are also the more unhelpful, but natural, aspects of politics, with personal ambition and desire for influence continuously at play – whether in the foreground or beneath the surface. The nature of the challenges facing Leadership Teams means that conflict is part of the work. Bringing together the different views of the enormously complex situation facing any organisation needs to create conflict. It’s part of the work. Every Leadership Team needs to be good both at creating it and also at handling it constructively. Unlike all other work groups, the Leadership Team has no-one beyond or above it to arbitrate when these views can’t easily be reconciled. The team must, therefore, both create conflict and resolve it. Not all conflict is good conflict, however. The conflict teams need is generative, constructive and involves bringing together ideas and perspectives to find new solutions that are better than individuals could have found alone. Too often, though, teams are stifled by conflicts based on personal antagonism or attempts to force win-lose conclusions. To succeed in this environment, there are 5 Key principles that any successful attempt to develop the Leadership Team must follow. Principle One: Development work is always focused on, and built around working on the real issues in real time. Leadership Teams have to learn ‘on the job’. The programme must be designed to use today’s business challenges as the vehicle for learning how to work better together. Principle Two: The programme needs to be sustained over a period of months. One off ‘awaydays’ can have a value and help the team over the short term – but their effects will quickly fade if not reinforced and built upon. Principle Three: Developing leadership requires work with individuals and with the team. Every member will be making a contribution to the dynamics of the team today. Each will, therefore, need to change their own behaviour to make a more effective team. That’s much easier to say than do, and every person will need separate support to make, and sustain, the personal changes needed. Principle Four: Work with ‘hard’ management and goal aspects as well as ‘soft’ behavioural and relational aspects. Given the pressures facing them and the types of people who are members, no leadership team will have the time, or the patience, to support a program unless it directly addresses the real and immediate issues of the day. Principle Five: Before, during and after assessment of progress against objectives. To establish, and sustain support from the team and other stakeholders, the programme must have clear and measureable business objectives – and be able to demonstrate that it is delivering them. Most attempts to develop Leadership Teams fail. When this happens it’s almost always because one or more of these principles will not have been followed. Developing leadership teams is easier than you might think. It’s not easy, but it isn’t complicated either. Approached in the right way, they can become the sort of team that leads by example, truly grasps the real, underlying people issues and takes the organisation to new levels of performance. Please visit our website to read more about The Six Conversations Leadership Team programme or download our article, the Seven Illusions of Leadership, which shows what it looks like in practice — based around a real case study.